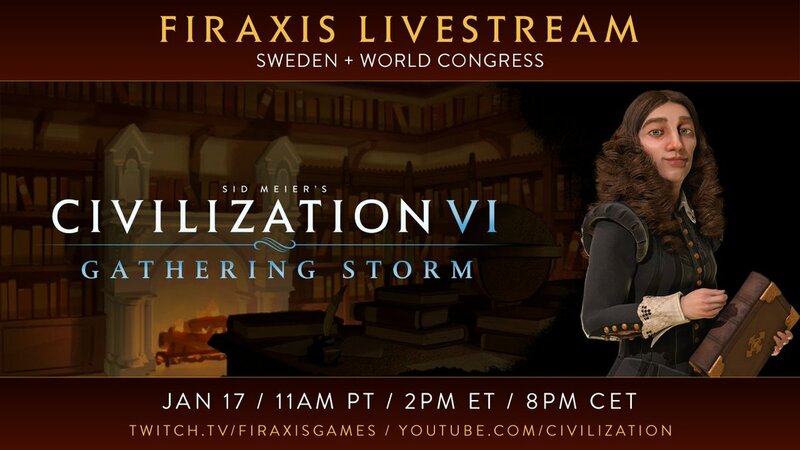 Discussion in 'Civ6 - General Discussions' started by bite, Jan 16, 2019.
nzcamel, Kjimmet, MrRadar and 1 other person like this. So. It's war then. Against an unknown aggressor from the north. I think he forgot to lock it. This is for tomorrow. I will take this time to point out the image isn't working for some reason. George Abitbol, nzcamel, bite and 1 other person like this. Aussie_Lurker, Leathaface, local_hero and 6 others like this. Aussie_Lurker and George Abitbol like this. NORWAYYY ! The north enemy ! I'm guessing they are avoiding the Atomic themes now. They will make us wait until release to listen to them. Unusually, I'm ready to watch the stream from the start this time. Given Sweden's focus, I'm optimistic for this one. Canada's livestream was my favorite so far. so now I'm thinking their Northern war is against Norway. I kind of forgot they were in the game when I said Russia before. Swedish theme again, but Industrial? Or Atomic? If Norway has been rebalanced at all, there's a chance we'll find out today. Norway has been my favorite civ. Hopefully it’s got some nice enhancements. Have beserkers be useful for more then just the era score. * Kristina's agenda: "She likes great works. Kinda like Pedro's thing for Great People, but for Great Works"
* Her agenda is called "bibliophile"
KyivanRusCivPlease, conorbebe, Leathaface and 5 others like this. For once, I'm not at work for the livestream. Great to be able to not be forced to have a small window opened in the background while I faked work... hem, to see it in live !